Mary creating the pages for A Sacred Geography at Dieu Donne in NYC. One day on that trip to Mustang, we encountered a sinuous wall of boulders etched with Tibetan prayers, mani. Its form rose from the plain, foreshortening space like an oncoming train. The wall was washed in sacred mineral colors of the three protector deities: rust red for Vajrapani, clay gray for Manjushree, and chalk white for Avalokiteshvara. I held these images of the Tibetan and Himalayan landscape—its sacred geography—in mind, hoping some day my experience would translate into art. Then in 2003, I made individually pulp painted sheets of paper, using variations of the three colors of the striped mani walls, to frame Sienna’s sonnets. A book slowly began to take shape. 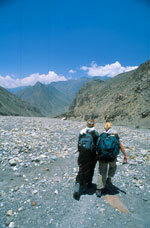 As we rode our way through geologic time, traces of an ancient seafloor poked up from the Kali Gandaki riverbed. Ordinary black cobblestones split apart, revealed hidden secrets from the once shallow Tethys Sea. These ammonite fossils –fetally curled spirals of life adrift in Pangaea’s salty amniotic fluid – pushed heavenward as the tectonic plates carrying the land mass that is today called India pressed against the Eurasian continental plates 30-50 million years ago, to create the highest mountains on Earth. I picked up one of these fossils, known as a saligram in Sanskrit and Nepali, and saved it in my pocket. My saligram- inspired drawings were converted into an engraved image that was pressed into each decorated sheet of paper. 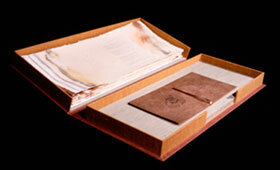 The format for the book would limn the loose-leafed books of Buddhist sutras and classical texts of Mustang and Tibet.The fabric over board clamshell boxes were handmade by John Balkwill at The Lumino Press. 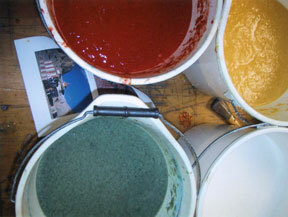 The text for the artist's book and the reader's copy was printed letterpress at The Lumino Press and constructed at Mary’s studio. The chapbook is printed in an edition of 100 copies and contains an Introduction and description of the places by Sienna Craig and an afterword, “On Collaboration” by Mary Heebner.